Macao and Hong Kong is separated by a coast. The distance is just about an hour by boat. It is very convenient. Together with the unique cultural characteristics of Macau and held a number of large-scale events, it has become popular tourist destinations recently. Taiwan is also good; the distance is just an hour plane, walking in Taiwan's night markets, enjoying local special snacks, as well as tours of local attractions are very popular attractions. It is no doubt that more and more Hong Kong people travel to these two places! Newsbook in view of this, know that many customers may be interested in the development of Macao and Taiwan business opportunities, specifically introduced Macao and Taiwan domain Name Service. Apply for the Domain service of Macao. 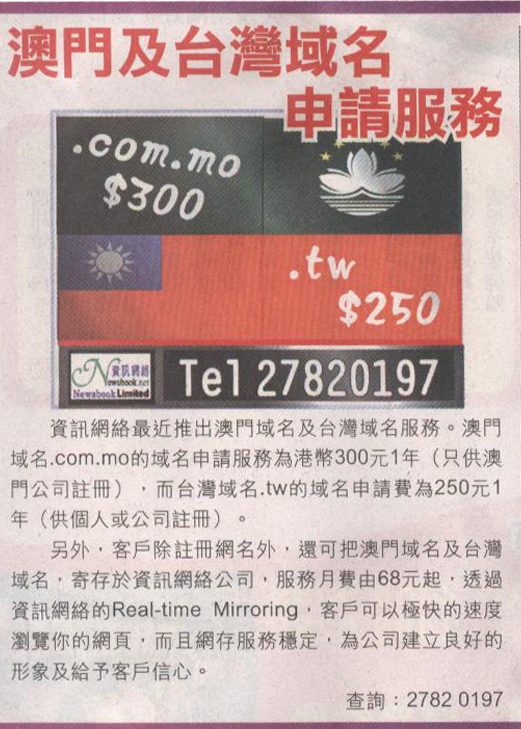 Com.mo is just HK $ 300 a year (only for the Macao Companies to register), Taiwan domain name. Tw for an application fee of HK $ 250 a year (for individuals or companies registered), it’s very valuable! In addition, the customer besides registered the domain name, you also host the Macao and Taiwan domain name in our company, services by a monthly fee from HK $ 68, through the real-time mirroring of newsbook, the vast peer-to-peer networks and in Hong Kong, adjacent to the rest of Asia and the United States, Internet Exchange Points (IXPs) in the data center, your customers can browse the web page you in speed helping you business development and publicity, and the network is stability, for the company to establish good image and give customers confidence. Newsbook business for years, with experience in senior services, providing customers with comprehensive business Internet services, in terms of quality of service and attitude are constantly strive to enrich it is trustworthy. Be interested in these, do not hesitate, now accounts it! If customers have any questions about the above can be www.newsbook.net browse, query or call 27820197.